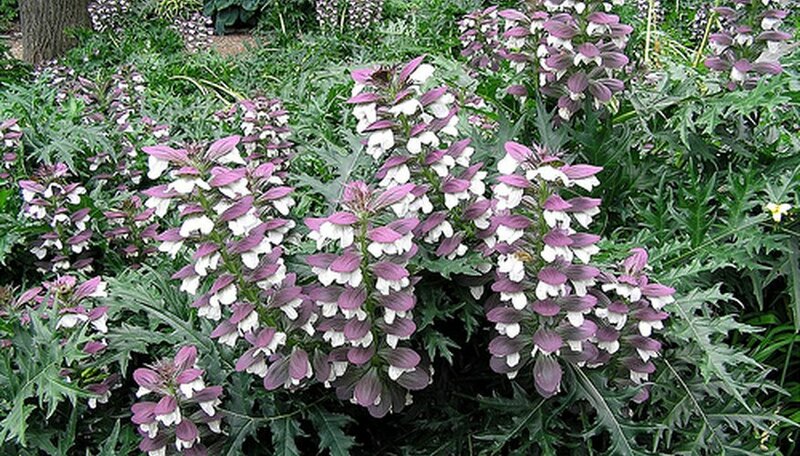 Bear's breeches, also known as acanthus, is a genus of flowering plants that includes both herbaceous and shrub species. They are native to Asia and eastern Europe, and can grow up to 5 feet in height. They bloom during the summer, and produce white and purple flowers. Bear's breeches are drought tolerant and require very little care, thriving in most temperate and tropical regions around the world. Plant bear's breeches during spring in a location that receives between six and eight hours of direct sunlight each day. Cultivate the soil using a garden tiller prior to planting to increase drainage and make it easier for the roots to penetrate. Dig a hole several inches larger than the root ball. Remove the bear's breeches from the container and gently spread out the roots. Place the plant in the hole and cover with soil. Water thoroughly to compact the moist soil. Leave about 3 feet of space between the bear's breeches and other plantings to allow plenty of room for growth. Water bear's breeches twice a week during the first year of growth, just enough to keep the soil moist. Reduce watering to once per week at the start of the second growing season. Do not allow the soil to become soggy, or root rot can occur. Feed bear's breeches twice per year, once in early spring just as growth resumes, and again in early fall. Use a balanced, 10-10-10 NPK fertilizer and follow the manufacturer's directions for proper dosage. Water before and after applying to prevent root burn. Check foliage regularly for signs of slug infestation. Bear's breeches are susceptible to slugs, which can destroy foliage. If not visible, a slug infestation can be identified by shiny trails along the leaves. Pick any slugs off by hand, and set slug bait near the plant to keep the damage to a minimum. Use a spade, shovel or hoe in place of a garden tiller, if desired or necessary. Bear's breeches can be grown from seed, but will take three to four years to bloom. Container-grown plants will usually bloom the summer after being planted. Be extremely careful not to harm the roots of bear's breeches. Even the slightest damage will cause the plant to spread and send multiple new shoots to the surface.